I have had some questions lately from artists who want to start selling their artwork as digital printables on the internet to make some passive income. 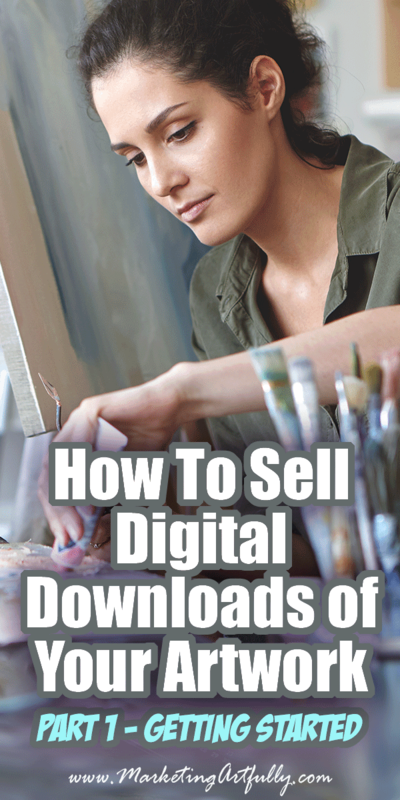 Here is a overview of what is involved in selling digital downloads of your artwork. As an artist, creativity is your most important goal. Making money, however, can also be a goal. The old way of selling each piece, being discovered and getting a show in a gallery still happens, but there is a better way. 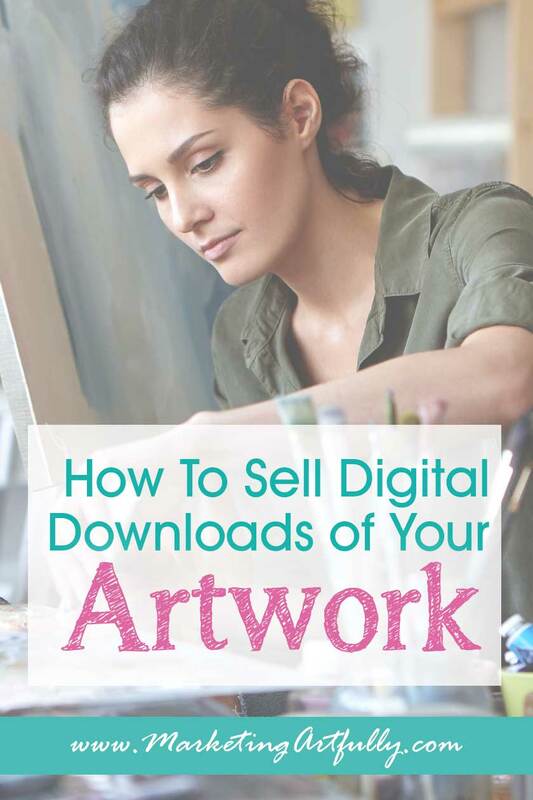 You can make more selling digital downloads of your work on the web. But how do you get started? Please note, there are affiliate links in this post! If you happen to get something I recommended I will get a wee little bit of a commission. What Is A Digital Art Print? It can be a few things. It could be art created right on your computer using various programs like Adobe Photoshop or Illustrator, a scan of your artwork, or a photograph of art you made on paper or canvas. The files are usually .jpg, .tiff or .pdf files. They can be easily printed from a printer, or onto other media by the person purchasing the file. Functionally, when someone buys your digital file listing you will be sending them a link to download that artwork. When you sell a digital art print, you give the purchaser the right to print that file as many times as they wish in whatever form they choose for their own personal use. What you don’t give is the right for them to sell that file or print outs of it to someone else which is called a commercial license. 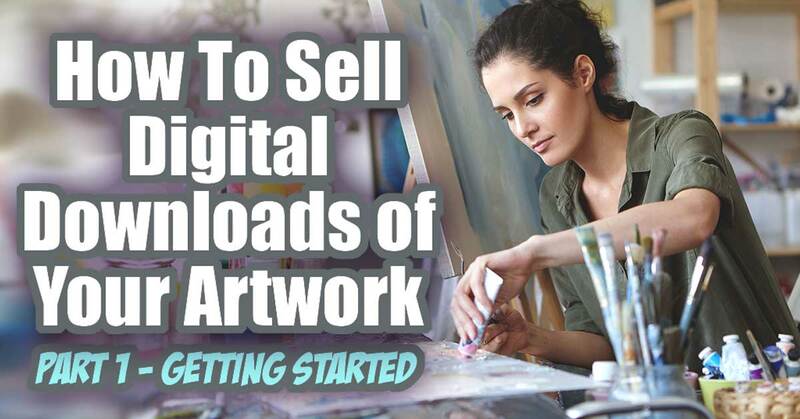 As I was writing the second part of this series I was reaching out to some of my favorite artists to use as examples and almost NONE of them were selling their arwork as downloads… gasp! You can take your backlist of artwork and find a new audience. Many people can’t afford to buy originals of your work or even want to get prints, but they can buy a digital download and print it out themselves. You can get new raving fans. Maybe some of these new people who have been exposed to your work will eventually buy an original or print of your art in the future. It is so darn easy to do! If selling your artwork as digital download printable was hard, I promise I would tell you… I am honest that way. But it is really easy to do… see below! Last but not least, it is a passive revenue stream. No more printing out prints yourself, putting them in envelopes and mailing them OR ordering online and having them sent OR ordering giclees and hoping you sell them all. YES, you can keep selling your artwork that way, but why not add a totally free, hands free additional revenue stream to your art business? If your artwork is 8.5″ X 11″ or smaller, you can simply use a high quality scanner that hooks to your computer. In this case you would place the artwork down on the panel, click scan and the scanner will make a digital file of your art. For this you will probably want to find a scanner that allows you to control the artwork by laying it flat rather than pulling it roughly through a business style scanner. It will produce up to a 4800X4800 dpi (dots per inch) file that you can send to your buyers. The main thing to look out for in a scanner is that it is designed to make photo quality files. You will want to bring a flash drive with you that you can have them transfer the file to or ask them about emailing it to you directly. Last but not least you can have a photograph taken of your artwork at a really high resolution. This will require the use of DSLR or SLR camera… not your iPhone! No matter how good you think your cell phone camera may be, using it to make the digital file is not a good idea. Your cell phone camera has a smaller display that for most phones is set at 72 dpi (dots per inch) for digital displays. The problem with smaller files is that to give a customer a file that will print at larger sizes clearly, you need a file with a minimum of 300 dpi for a home computer and even higher for professional printers. Okay, now that you have a file to sell, let’s talk about how you can sell them! The very easiest thing you could do to sell your Digital Artwork would be to put a picture of it up on your website or social media and have a link to a PayPal payment then email the file to the customer. This could be a little kerfuffly and hard to track but it is totally possible and if that is all you are capable of now, start there! I am a total Etsy fangirl for selling digital files (I sell planners) because of the ease of using it as a seller. They handle all the logins, payments, file delivery and even have marketing tools built in that help you get the word out about your products. If you are even a wee bit able to use the computer, I recommend starting with Etsy. They are used to working with artists and have lots of great info about getting your shop up and running easily. The big drawback to Etsy is that you are competing with lots of other sellers. The benefit is that lots of buyers know they can find great artwork to download on Etsy. Last but not least you could set up a Shopify store or sell from your own website. If you are just beginning your selling trip, this is going to be the hardest and most time consuming. That said, if you already have a super popular website or social following and don’t want to have to split your profits with a sales site, building your own store could be the way to go! A wee bit ago I said I would tell you more about licensing. I waited until you got down here because it can be a confusing and scary issue and I wanted to make sure to cover it well. As the creator of the artwork, you get to decide the licensing options for your digital products. You can give the buyer the right to print unlimited copies or just one. You can also upsell them to a commercial licensing agreement if that is of interest to you. But to start, just go basic and get your listing up and selling! Here is a free artists licensing agreement that you can review! Functionally what it says is that you are giving the buyer the right to use your artwork in the manner intended in the listing they bought and that you DON’T give them the right to use it in any other way. Please note that the vast majority of the people who are buying printable artwork are wonderful buyers who are just getting something to print out for their home or office! Don’t get so hung up on the bad apples that you decide that selling your artwork digitally is just too scary!! One way you can help protect your artwork is to send a Word doc with the licensing agreement AND a page that they can take with them to Kinkos or Office Depot that gives them to the right to print out the file in the manner that you dictate. Many print shops will not print out artwork without express permission from the artist, so you will be saving yourself frantic calls from your buyers. The nice thing is that you can say things like … approval to print up to 3 copies of this work for personal use or printed in the size specified by the file. Sell a few and see how the process works and what is popular! The biggest mistake I see ALL new sellers make is that they try to get everything “perfect” before they start. If you are thinking about doing this and have gotten this far, for sure get a file made and just start trying!